The Desktop version of VivaDesigner is available in several free of charge and licensed editions. All licensed editions of the desktop version except the Classroom Edition are for one workstation only. 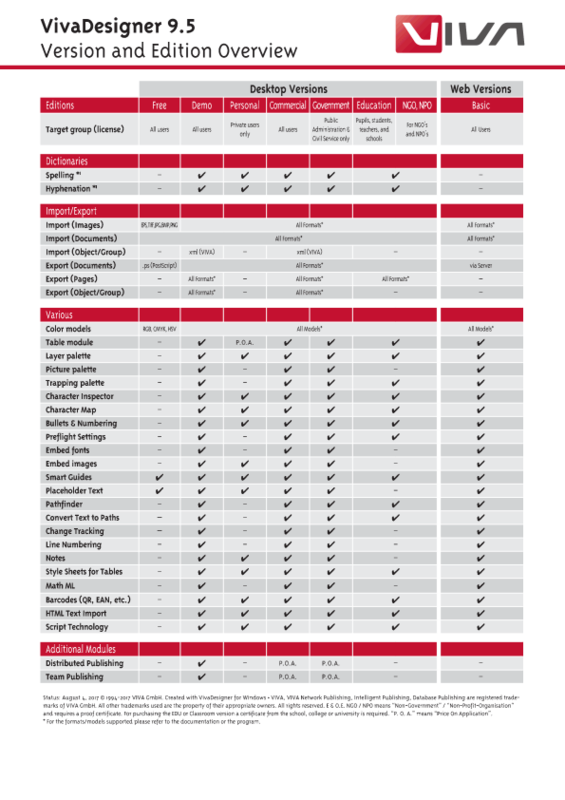 Please have a look at our detailed version overview/comparison (PDF) on the right hand side. We recommend the free of charge “Demo/Trial Version” if you want to TEST VivaDesigner for a limited time. The functionality of this version is almost identical to the Commercial Edition. After the trial period expires, the version can however still be used as a free of charge “Free Edition”, or you can unlock the version with a license key that you receive when you place an order. Use the free of charge “Free Edition” if you want to use VivaDesigner permanently free of charge on a private or commercial basis. The program functionality is limited for licensing reasons. You can however still open documents from the other desktop or Web editions, edit, save and print them. The “Free Edition” may be used for both private and commercial purposes. Please also check the information on the demo/trial version. Use the licensed “Personal Edition” if you want to use the full version exclusively for private and non-commercial purposes. Non-commercial purposes are for example printed material for charitable organisations, public education institutions and all printed material for private use. Use the licensed “Commercial Edition” if you want to use the full version for commercial purposes. Commercial purposes always occur if you want to use the software within your corporation or if it is your intention to use the software for commercial profit. EDU editions are exclusively for school pupils, students or teachers. Proof of study is required in the form of a school pass or student ID, or a certificate from the school, college or university. The Classroom Edition is exclusively for school pupils, students or teachers in classrooms. Proof of study is required in the form of a certificate from or an order in the name of the school, college or university. Classroom licenses are issued for a specific number of workstations (max. 25), of which maximum 3 workstations may be occupied by trainers/teachers. Each workstation receives an individual serial number linked to the workstation's Ethernet-ID (Mac-address). These editions are exclusively for non-governmental organizations (NGO) or non-profit organizations (NPO), which have no economic profit goals, but follow exclusively charitable, social, cultural or scientific goals. The license must be ordered in the name of the organization and proof of status should be provided. Clubs/Societies and charitable organizations must provide proof of their status. This may be a copy of a declaration by the tax office or registration with the local authority. Note: Political parties are not regarded as NGO’s or NPO’s. Political parties may order the specially priced government edition (GOV). These editions are exclusively for all governmental organizations (GOV) including local government, tax offices, employment offices political parties, etc. The license must be ordered in the name of the governmental organization and proof of status should be provided. The Web version of VivaDesigner is available in several editions. You can find a function overview for the different editions on our Website. Click here to open or download the VivaDesigner Edition Overview.